Church Submission to Christ – A Works Agenda? On January 19, 2016, I received the following e-mail from a brother in Christ. My reply follows his e-mail below. 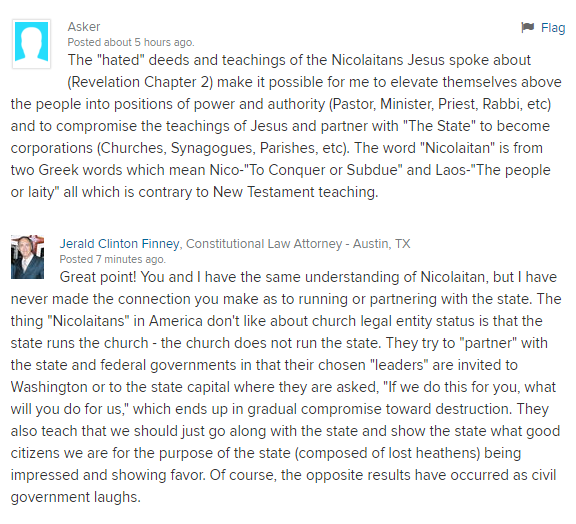 I am deacon in a nondenominational church and in the past few years GOD has brought the issue of church incorporation and many other matters before me regarding how we relate to government. Needless to say it has not been taught thoroughly. When I presented the problem to the “board” last year it was quickly rejected by pastor and most of other deacons except for one as unimportant and was promoting a “works agenda”. I have prayed about the issue and GOD has at least softened my pastors heart in regards to hearing what is involved in unincorporating. Which brings me to thanking you for all the valuable information in scripture and otherwise you have put together on this subject. This strikes as false to me. Please back up with scripture. Fewer and fewer souls are not saved NOT as a result of a individuals or churches failure to present the gospel. GOD has foreknowledge of who will believe and he is not limited to providing them with the way of salvation because of the failures of a church or individual. That would violate his attributes of Omniscience and Omnipotence. Did he not know from eternity past who would and would not believe? No doubt we are to be a SALT and LIGHT and be prepared to give the GOSPEL when the opportunity arises. Thanks for your e-mail. It is always good to hear from a believer who loves the Lord and is sensitive to the word of God and his precepts, and seeks to promote those precepts in his church body. Thank you for your interest and concerns. You ask a very good question. So, according to Scripture, one is not to leave out some lines and some precepts. One is to begin in Genesis and read and study through Revelation to grow in knowledge and understanding of a doctrine. That is what I did. I considered all the relevant doctrines of Christ, taking in all of related Scripture, just believing what I read, without interpretation. Therefore, I could not distort or leave out those parts that did not agree with an interpretation. One cannot fully understand all that God has for us in his word. Therefore, it is best just to believe it all. Those verses show both the sovereignty of God and the free will of man. 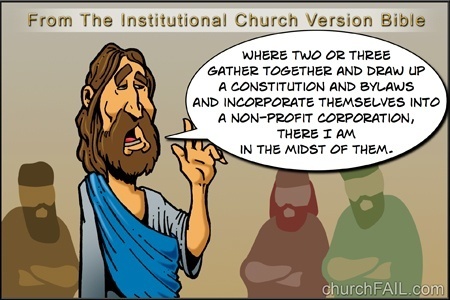 Those verses (and many other verses which I do not quote here) make clear the nature of the relationship and that churches are free to either honor or dishonor that relationship. God honors the relationship. The question is, “Will a church honor the relationship.” Should a church honor the relationship, she will be a “glorious church, not having spot or wrinkle,” since Christ will, without fail, honor the relationship. Christ gave himself for the church. The only question is whether a church will be subject to and give herself to Christ. A church is sanctified and cleansed ” with the washing of water by the word.” The church body is to get into the word of God, study the relevant precepts, and apply them in and to the body. I believe in the sovereignty of God. I believe that the Bible makes clear that God is sovereign and that, as sovereign, he allows men to choose life or to choose death. There are many, many, many verses in the Bible that teach free will as there are that teach the sovereignty of God. I agree that God has foreknowledge. God knows who will choose life and who will choose death. Nevertheless, we see his warnings and pleas for man to repent and choose life throughout Scripture. We also see that he points out the consequences of loving him as opposed to rejecting him throughout Scripture. The Lord instructs believers in the New Testament to preach the Gospel to everyone. Likewise, we see that God tells us about heresy and apostasy and where it leads. See my articles on apostasy below. The apostasy of Israel and the apostasy of the church followed the same pattern and result(ed) in fewer and fewer coming to the Lord to the point that, eventually, in Israel, only a small remnant believed and followed God, his statutes and commandments; the point was reached where the only remedy available to God was judgment. The same is true of the church age – the apostasy has led to fewer and fewer coming to and following our Lord. God’s word explains what the results will be. The Bible teaches that there are three steps in the downfall of a nation – religious apostasy, moral awfulness, and political anarchy. Romans 1.21-32, which gives the seven stages of Gentile world apostasy (verses 21-23) and the result of Gentile world apostasy (verses 24-32) demonstrate both the sovereignty of God and the free will of man. May the Lord bless you as you seek to do his will. 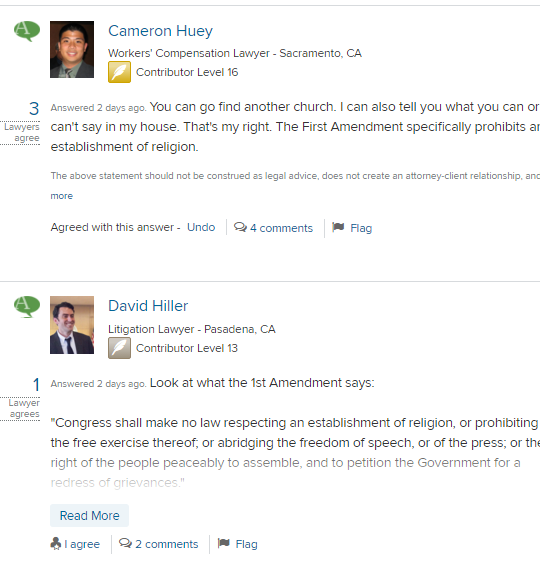 Several lawyers, including me, answered the question. The asker chose my answer as the best answer, and then, in subsequent replies by him and me, I learned something I had not thought of. The webpage with the questions and answers is copied and pasted below. 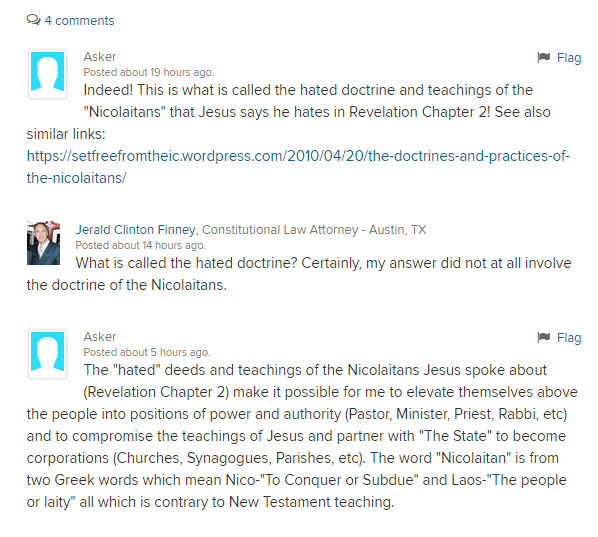 For some reason, the website removed my answer, and the asker’s and my replies. 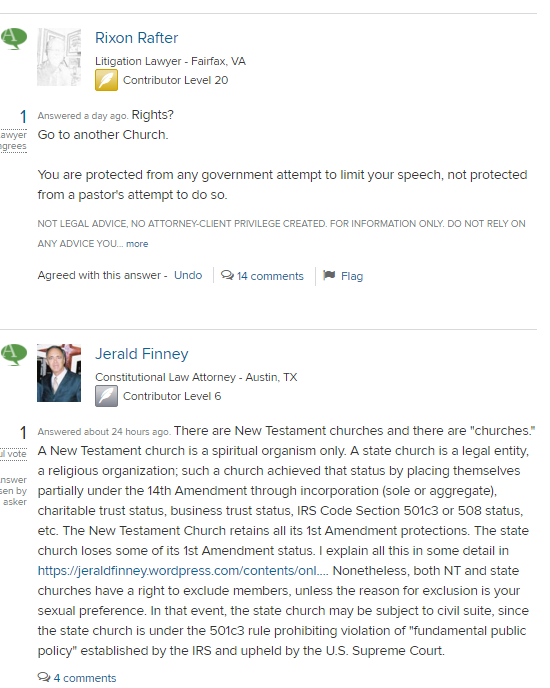 First Amendment Protection of New Testament Churches/Federal Laws Protecting State Churches (Religious Organizations) by Jerald Finney, February 2010. Copied and pasted below is the page to this date, January 17, 2016. The cite for the webpage (where you may see the dialogue yourself as well as any future replies) is: What are my legal rights? 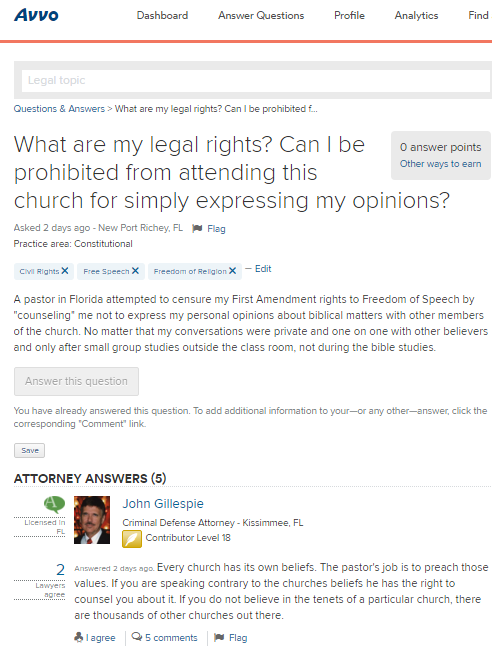 Can I be prohibited from attending this church for simply expressing my opinions?